A new intraoperative handheld probe for cancer-cell-detection enables surgeons, for the first time, to detect more than 92% of invasive brain cancer cells in real time during surgery, according to its developers at the Montreal Neurological Institute and Hospital – The Neuro, McGill University MUHC, and Polytechnique Montréal. According to co-developer Frédéric Leblond, PhD, Professor in Engineering Physics at Polytechnique Montréal, and co-senior author of the study, the probe technique uses Raman spectroscopy laser technology to measure light scattered from molecules, based on preliminary tests on patients with grade 2, 3 and 4 gliomas. “The emitted light provides a spectroscopic signal that can be interpreted to provide specific information about the molecular makeup of the interrogated tissue,” says Leblond. The Montreal Neurological Institute and Hospital plans to launch a trial for patients with newly diagnosed and recurrent glioblastoma. This work was supported by the Fonds de recherche du Québec–Nature et technologies, the Natural Sciences and Engineering Research Council of Canada, and the Groupe de recherche en sciences et technologies biomédicales. Cancers are often impossible to visually distinguish from normal tissue. This is critical for brain cancer where residual invasive cancer cells frequently remain after surgery, leading to disease recurrence and a negative impact on overall survival. No preoperative or intraoperative technology exists to identify all cancer cells that have invaded normal brain. To address this problem, we developed a handheld contact Raman spectroscopy probe technique for live, local detection of cancer cells in the human brain. Using this probe intraoperatively, we were able to accurately differentiate normal brain from dense cancer and normal brain invaded by cancer cells, with a sensitivity of 93% and a specificity of 91%. 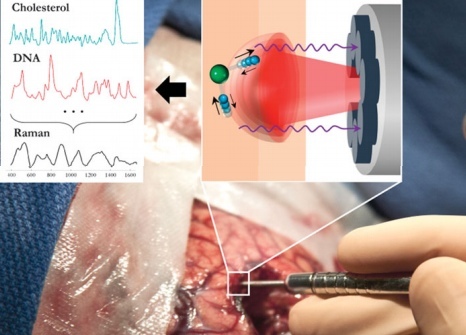 This Raman-based probe enabled detection of the previously undetectable diffusely invasive brain cancer cells at cellular resolution in patients with grade 2 to 4 gliomas. This intraoperative technology may therefore be able to classify cell populations in real time, making it an ideal guide for surgical resection and decision-making.